Now that the first main treehouse beam was up in the tree and (more or less) secure with webbing, it was time to attach it permanently. Some of the things I'd be hauling into the tree. Notice all my tools have safety lines on them -- it's no fun dropping things you need. However I can report that a steel pipe wrench dropped into a flower bed from 30 feet will bury itself about five inches into the dirt, so there's that. The big lag screws needed to be pre-drilled; I’d ordered a long 1-inch diameter auger bit, with the thought that since the wood was living and fairly soft, it would be a good fit for the 1.25” diameter lag bolts. A good fit, but tight; I knew I’d need a lot of force to screw it a foot or more into the tree, so I’d be bringing a large steel pipe wrench. For the drilling itself I’d be hauling up a corded drill for the extra power; rounding out my tool bag for the day were a small level and several additional tie-down straps, for whatever came up. You can never have too many tie-down straps when you're building a treehouse. I knew I’d need to be able to put weight behind the drill to make things work; I’d be going through the 2x12 beam as well as the tree, and it needed to be a straight and level hole. Putting weight behind anything when you’re hanging from a rope is a bit of a challenge (thanks to Newton’s laws of motion), and after an hour or so of trying different branches and hanging in different ways, it became clear I wasn’t going to be able to drill into the tree without coming at it from a direction where there wasn’t anyplace to stand. So I picked up a 40-foot extension ladder, barely used. I figured since I was going to be the proud owner of a 30-foot-tall treehouse, it wouldn’t necessarily be the craziest investment ever. Myself, I can’t stand working on ladders. No matter how well they’re secured, I just can’t seem to calm down and trust them. 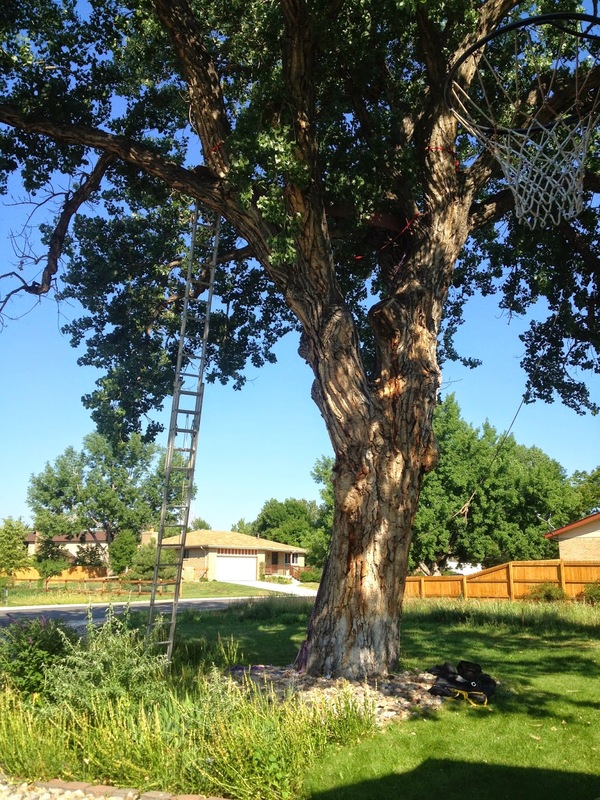 In this case I fortunately had a ready-made solution; once I got the ladder in place, I went up while tied safely into my rope rig and strapped the top of the ladder right to the tree. I staked the bottom to the grass as well, and as a final safety measure decided I’d stay roped-in even on the ladder, so I wound up feeling pretty good about things. As good as you can feel on a long ladder that got bouncier the higher you went up, that is. I was really sure that the 40-foot ladder would be the tipping point at which random passers-by would start asking what I was up to. It wasn't, no one seemed interested. I don’t have any photos of myself drilling the hole, but it was fairly exciting. After I got up there, I pulled up the drill and other tools, put the auger bit in, checked the level, and started drilling. Fortunately for me, it went in (and out) smoothly; I might’ve been in a bit of a pickle had it bound up in any way. Next I hauled up the pipe wrench — that big steel thing was heavy, and exhausting to work with. I slipped the black square washer onto the lag bolt and hand-twisted it an inch or so through the 2x12 and into the tree. 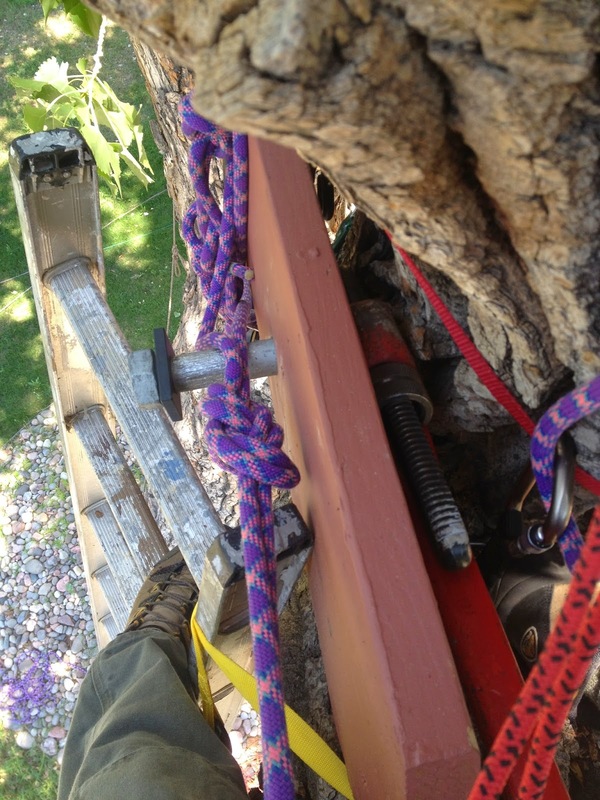 As I put the pipe wrench up to the bolt, it suddenly became apparent that because of the way the branches were growing at this spot, I’d have to push up on the wrench to tighten the bolt — while standing on the wobbly ladder. This tuckered me out after just a few minutes, and after less than an inch of progress into the tree, so I clambered up off the ladder and wedged myself in between a few branches. 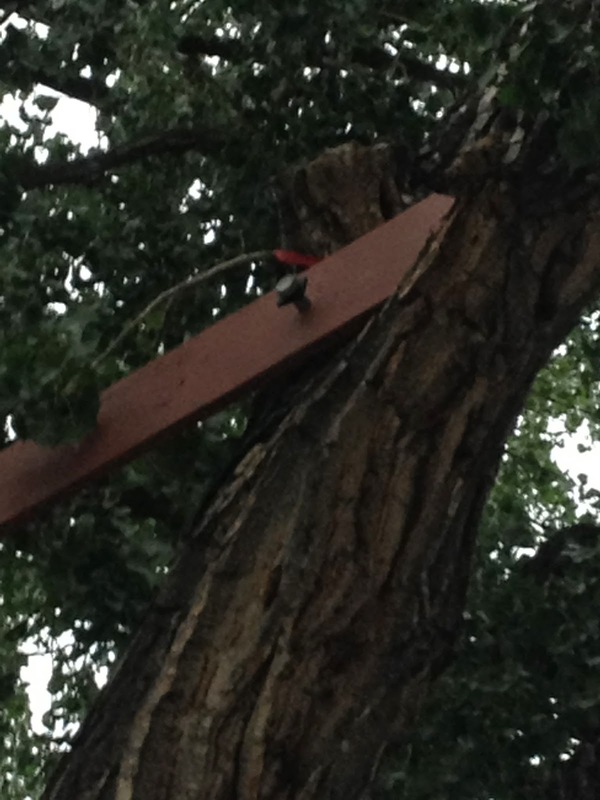 There was just enough room to slip the wrench in between the tree and the beam — I wanted the beam to be a few inches from touching the bark anyhow, and the distance also ensured the beam would move freely, so I could adjust the whole beam and make it level from the other end. Every bit as unnerving and cumbersome as it looks. It was the best way to do it, but even this turned out to be hard work. I had the wrench between my knees and was literally pulling as hard as I could to turn the bolt into the tree. And, of course, it was a hot day with no breeze. Eventually I’d managed to get the bolt as far in as I imagined possible — and, with more than a foot of it buried into the tree and rock-solid, I decided that was plenty. Here’s what it looked like from the ground. Black square washers say "I meant it to look this way." Next up was the “adjustable” side, which would also act as my insurance policy against the tree destroying the treehouse. Did I miss you explain why you couldn't use socket wrench? No reason other than availability and leverage; I had 36" pipe wrenches available, and didn't have a socket big enough to fit (or long enough to turn) the bolt.